Cloud bread is a very light and fluffy bread substitute. 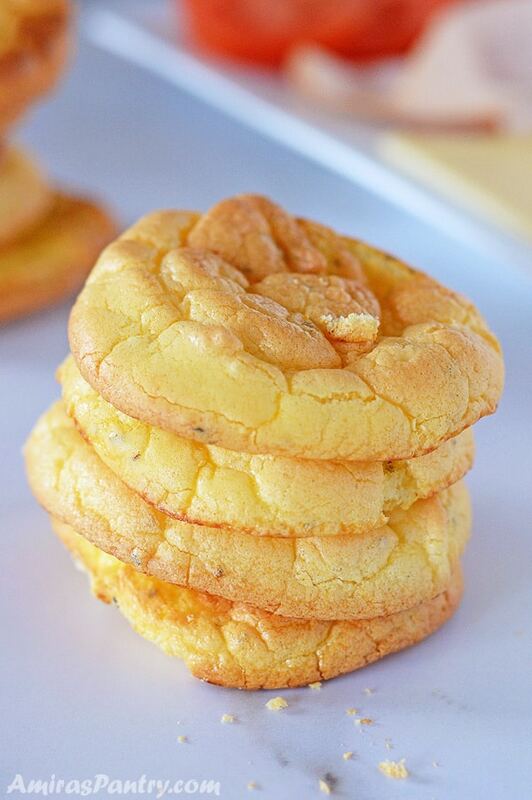 This keto cloud bread recipe is also gluten free. Knowing that it is only 41 calorie makes it a perfect way to lighten up any sandwich. This cloud bread recipe works perfectly in any situation and with little imagination, you can go wild with it. A sandwich bread for burgers, crisp them up in a toaster for a PB and J, make pizza, Arabic pizza, garlic bread, sloppy Joe…etc.The right bread for a high protein, low carb, no sugar diet. Check out this amazing low carb chicken Parmesan recipe. 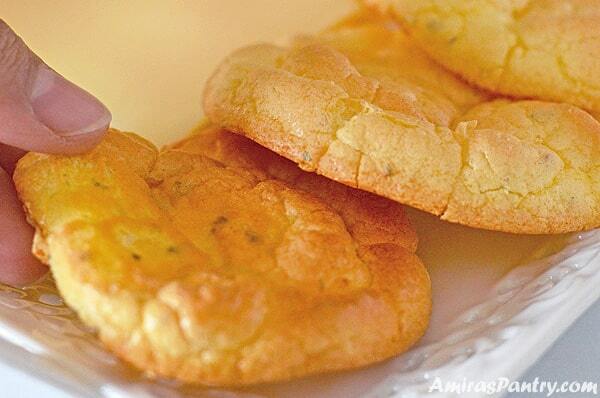 Cloud bread is a soft airy and fluffy bread made basically with eggs. 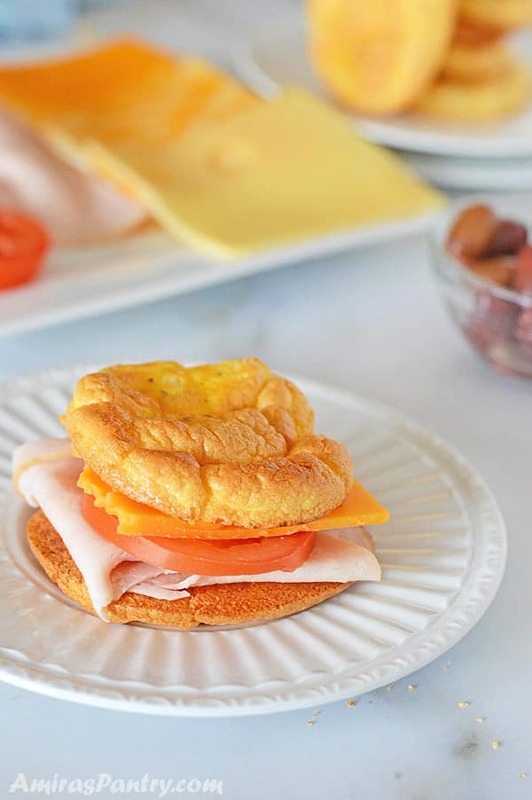 Cloud bread is low carb, gluten free, keto and grain freer which makes it perfect for almost any sort of diet you are following. This cloud bread recipe can be a vehicle to so many flavors. The variations are almost endless. Think spices, cheese and even sweeteners. You can pretty much put whatever toppings on it, think a little sweetener and cinnamon as a dessert. I’ve used larger forms for my burgers and stuffed them with turkey and cheese as well. You also can use them as a pizza base too!! Isn’t this great?! I’m not sure about the origin of this recipe but I’ve also heard that this recipe first appeared in the Atkins Diet cook book back in the 70s. So for the person who invented this amazing thing, thank you from the bottom of my heart. I am a firm believer in moderate consumption of everything. But, there are seasons in our lives where we must do something to shake things up a little bit. Some of you might want to speed up the process to get their bikini bodies  before summer hits. I am having a challenge with my friends to get in shape before summer as well and this is one of my go to recipes. I am trying to lower my daily intake of carbs and sugar, which is very hard for a food blogger… trust me. But many times I crave a sandwich and feel like a normal person again. Although it’s not firm enough to replace bread in a regular sandwich, but it is one of the easiest ways to enjoy “bread” without all the carbs. Cloud bread does not taste like wheat bread at all, it is more like very fluffy eggs. It is of a soufflé-like or a chewy meringue texture especially when it is fresh from the oven. A couple of hours later it will set to a more bread like texture. Is cloud bread Keto friendly? 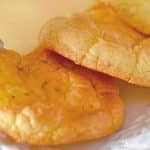 Although this cloud bread recipe includes cream cheese, it is indeed Keto friendly recipe. Cream cheese is one of the low sugar dairy products out there, so no worries. Why do I need cream of tartar in this recipe? Cream of tartar is used to stabilize the stiff peak we need. Some people use vinegar though, but if you cannot find it then feel free to skip it altogether. You’ll just take longer to reach the stiff peak state. Cloud bread keeps up well for a week in the refrigerator and up to 3 days on the counter. You can also freeze cloud bread individually, thaw and reheat in the oven or toaster(carefully) before using. Shake things up with cloud bread by using bold spices, think cumin, chipotle chili, turmeric, smoked paprika…etc. In this recipe I shaped mine into rolls. You can also bake the cloud bread in a loaf pan or muffin tins. To make a dessert: add cinnamon, vanilla or nutmeg. Sprinkle the top with crushed nuts or sesame seeds. Use vanilla yogurt instead of cream cheese and top it with fresh fruits. What other alternatives to cream cheese? Unable to get cream cheese, no worries. You can use cottage cheese, sour cream, ricotta cheese or even mascarpone cheese. What if I am watching my fat intake? To reduce fat in the recipe go for Neufchâtel instead of full fat cream cheese, it has 1/3 less fat. You can also use Greek yogurt and may be go for a low fat one. How about a Dairy-free cloud bread? There are varieties of dairy-free cream cheese in stores these days, but if you cannot find them here are some great alternatives. You can use thick cream from a can of coconut milk, I’ve seen another recipe using mayonnaise as well. This is an easy on spot cloud bread recipe, no disappointments here. It needs a little skill but do not let this put you off, let me show you. In a bowl, add egg whites with cream of tartar if using. Beat them both together until you reach the stiff peak stage. You’ll notice that the egg whites will turn foamy, then soft peak stage then stiff peak, if you overbeat the egg whites, no worries there is a way to save it just go to the tips and tricks section. In another bowl, add egg yolks, cream cheese , spices and mix well. Gradually fold egg yolk mixture into the egg yolk mixture. Try not to deflate the egg white mixture when you mix until everything is fully incorporated. Scoop on a baking sheet lined with silpat or parchment paper and bake for 30 minutes in a 300F oven. Wait for it to cool down then let it set overnight on your counter in an open bag. This pretty much helps reduce the egg-y flavor in them rather than eating them straight after baking. In my opinion the hardest part in this recipe, especially if you are new to the kitchen is reaching the stiff peak stage when beating the egg whites. Here is a video that will clear any confusion you have with the nice trick of just adding one more egg white if things went wrong and you’ve over beaten your egg whites. First, you’ll need to start with a room temperature eggs, this ensures that you get the most volume. Make sure that your mixer’s bowl and whisks are very clean and do not have any fat residues. Using cream of tartar is recommended as it helps stabilize the shape. Start on low to medium speed, egg whites will appear frothy. Continue beating and you’ll get the stiff peak that we need. If you lift up your whisk or beaters, you’ll get a peak that is stiff and does not flip back as shown above. Add all the spices to the egg yolk mixture and not to the egg whites we do not want to deflate the egg whites. I love this baking sheets from Nordic Ware, they are very sturdy and do not bend at high temperatures. Cheesy, buffalo chicken spaghetti squash. Italian Sausage and cauliflower patties. If you would like to bake it in a loaf pan Here is a recipe from Brenda at sugarfreemom. 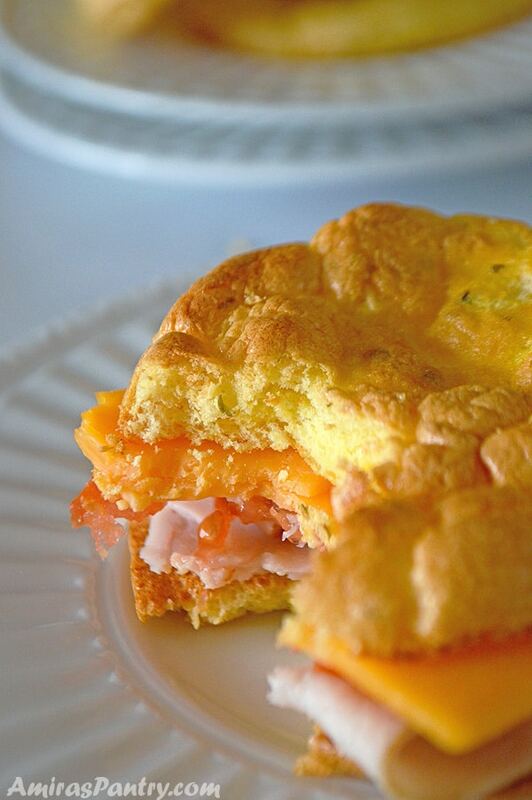 Light and fluffy Oopsie Rolls or Cloud Bread makes a great sandwich bread replacement. Ultra low carb, keto, grain free and gluten free. 3 Large eggs room temperature. 3 57 g Tablespoons cream cheese. Add cream cheese, parmesan cheese, garlic salt and oregano to the yolks and mix well. Beat egg white and cream of tartar until you get a stiff peak. 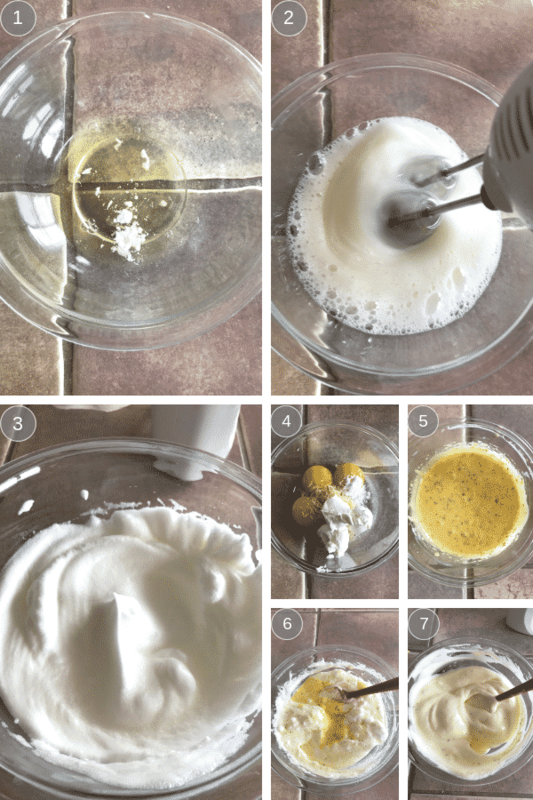 Using a spatula, gradually and carefully fold the yolk mixture into the egg white mixture. * If you do not have silat baking mats, you can just oil your sheet well. ** These will be very soft and eggy right after baking, better leave them overnight on the countertop or in an opened sack. This was sooo good, I made it several times and change the spices every now and then so I will not get bored. Emily, thank you for trying this recipe, I am glad you liked it. This is a terrific tip as we get bored easily especially on a diet :).